"A welcome gathering. Without this sort of exercise few of us would be able to stand back and consider the progress of songwriting either nationally or internationally. The choice here is discriminatory without fussiness. Just remember that CDs like this do not gain massive publicity or renown, yet they do a great service to both singer and song - and therefore music as an art." "Alison Smart shows that she has a fine range of expressiveness. She is heard at her best in Judith Weir's colourful and characterful Scotch Minstrelsy, Gabriel Jackson's Liadan Laments and - unaccompanied - in LeFanu's magisterial cantata But Stars Remaining, one of her finest and most closely argued works. She is ably supported by Katharine Durran, who does her own solo turn - the two solos from Maxwell Davies's Yellow Cake Review - very nicely. Metier's sound is admirably clear." 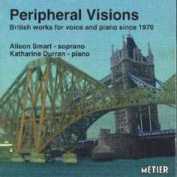 "METIER is devoted not only to independent-minded British composers but performers too. Here the impressive soprano Alison Smart, of the BBC Singers, makes her recorded debut as a recitalist, accompanied by Katharine Durran (whose complete Bach Toccatas is available on MSV CD2001). They offer an interesting selection of songs, often with a folkish flavour. James MacMillan's three Soutar settings have a timeless remote lyricism. Judith Weir's poignant song-cycle Scotch Minstrelsy is witty and spare, though not as spare as Gabriel Jackson's Liadan Laments, a terse but passionate setting of an Irish elegy. Robin Holloway's Graves cycle, Wherever We May Be, is typically fetching; George Nicholson's Peripheral Visions deliberately dessicated and droll. The Traherne prose and verse settings of the late Elizabeth Maconchy's Sun, Moon and Stars are powerful. Her daughter Nicola LeFanu's But Stars Remaining provides a solo vehicle for Smart, and Durran gives two little Orcadian solos by Maxwell Davies." BBC Singer ALISON SMART specialises in the performance of new vocal repertoire, although she is also very much in demand as an oratorio soloist. This disc is a must for those interested in new vocal repertory.